Now that I finally have an outfeed/assembly table to work on I could start to think about vise options. Through the years I have had many different dedicated work surfaces but I have never had a vise. I’ve always just clamped whatever I was working with to whatever was solid and in the correct orientation. Sometimes that worked. Most of the time it was just annoying. Because my work table is just a sheet of 3/4” plywood for the top mounting a traditional woodworking vise to the bottom wasn’t the best option. There just isn’t much support that way. 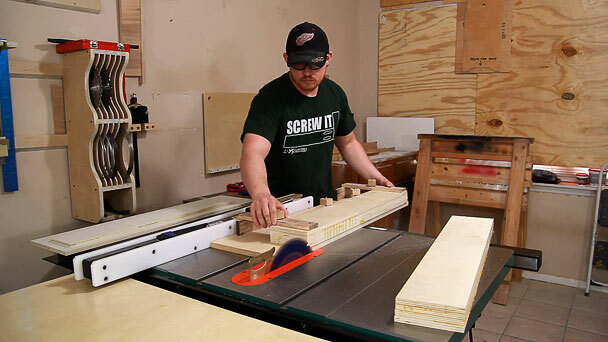 Another option is to spend over $150 for a Moxon vise hardware kit online. Then purchase the hardwood that is required to build it. 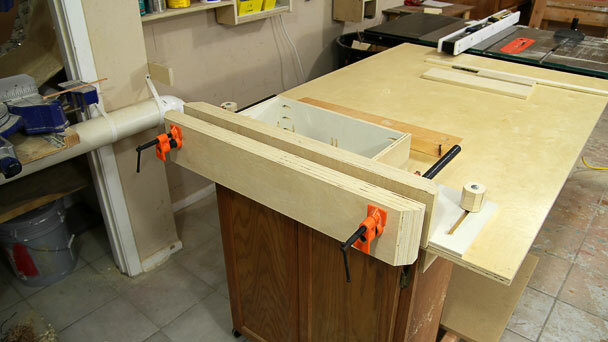 I’m way too cheap for that so I decided to design my own Moxon vise after looking at a few online. After cutting all the jaw pieces over sized I glue them up. I glue both jaws in the same glue-up to save time. And yes, watching glue dry is just as boring as watching paint dry. So to stay productive and not waste any time I ate some chips. After the glue dried and I was no longer hungry I jointed one edge of each jaw with my multi function hold down jig and then ripped them to their final width. Next I trimmed and cut the jaws to length using my cutoff sled. For standard 1/2” pipe clamps a 7/8” hole is needed. It’s best to setup a stop block and drill all 4 holes at the same time if possible. 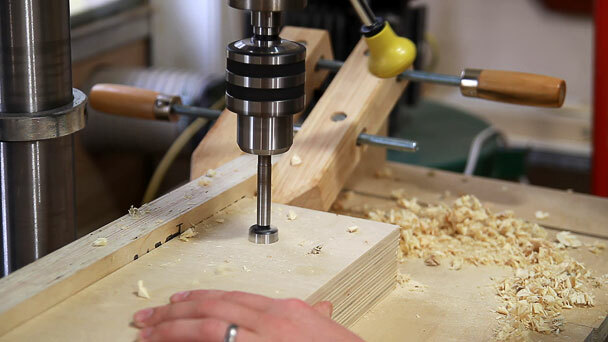 If you do not have a drill press you can probably get away with using a hand drill but just try to drill as straight as possible. To make the front jaw slide better and not bind as much you can make the opening a horizontal slot instead of a hole. The back jaw needs to remain a 7/8” hole though. Don’t make it any bigger. The reason a horizontal slot will work is it will allow the front jaw to skew left to right as you pull out the pipe. 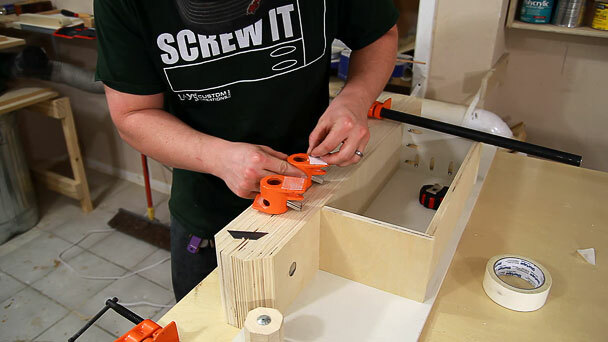 You don’t want to simply use a larger size hole as this will give more room on the top and bottom of the pipe to allow the front jaw to rack top to bottom when you are only clamping on the top edge of the vise. To attach the back jaw to the base a rabbet is cut. 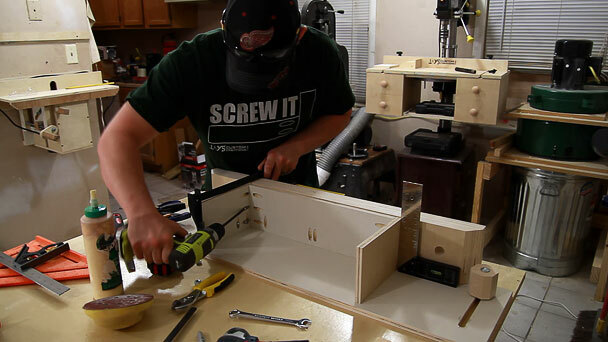 The base will be held to the bench with hold down screw handles. 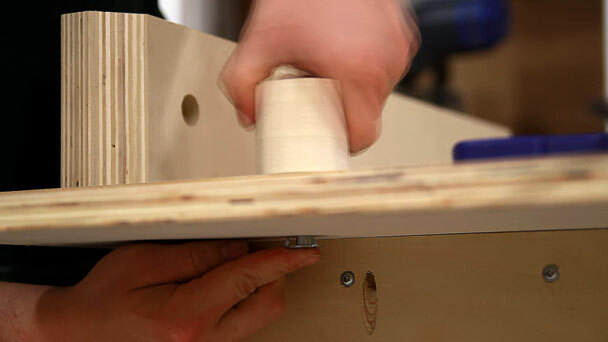 A slot is cut by drilling two over sized holes first and connecting them with a jigsaw. I’ve recently found out that a decent jigsaw and decent blades will make a fantastic cut. I’ve been a jigsaw hater for years probably due to the fact that I have always had a really crappy jigsaw. For the hold down screw handles I cut 2” cubes, drilled an undersized hole, and threaded a 3-1/2” carriage bolt through it. To make them a little easier on the hands I chamfered all the edges on the table saw. I also chamfered the back edges of the back jaw and the front edges of the front jaw. The back was chamfered out of necessity to give my hands more room to operate the hold down screw handles. With everything verified by a test fit I glued and screwed the back jaw to the base. After locating and drilling the two holes in my work bench I threaded the handle down to pull a t-nut up from below. I initially planned on having a few triangular support brackets to brace the back of the back jaw but thought this was just wasted space. So instead I made a simple box to store a block plane, pencil, or any other small hand tools that may be used often with the vise. The back jaws of the pipe clamps were held on to the back jaw with double sided carpet tape. This worked well for about a day. Since making this I’ve drilled two holes in the back jaw of the pipe clamps and secured them with screws. My final thoughts: WOW! This is downright awesome. I am absolutely blown away at how well this works. 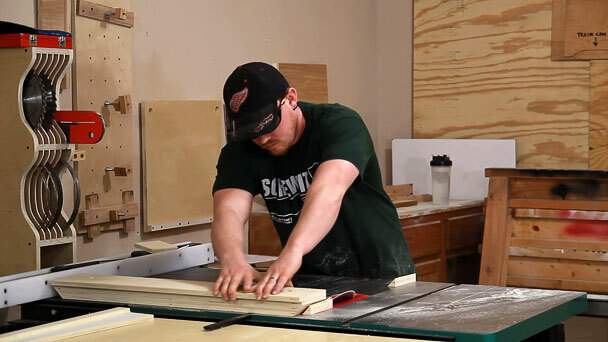 With the entire assembly slid forward you can clamp vertical panels to do end grain work and with the assembly slid backwards you can chop away at a mortise with all of the weight being directly transferred to the bench below. 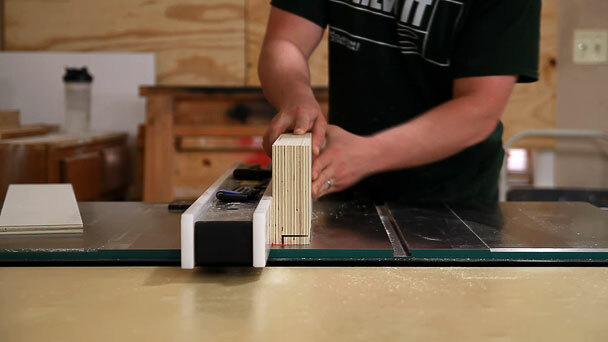 The four layers of 1/2” plywood offer plenty of support and barely flex. The 1/2” pipe clamps hold everything perfectly without wrenching down on them. With barely any pressure on the clamp screws you can really beat on whatever is clamped down and it won’t budge. Now I made mine out of materials I already had but if someone were to go to a box store I would imagine you could get everything you need to make one of these for about $40 to $50. This would include the options to change up the design and make it even wider if you really wanted to. 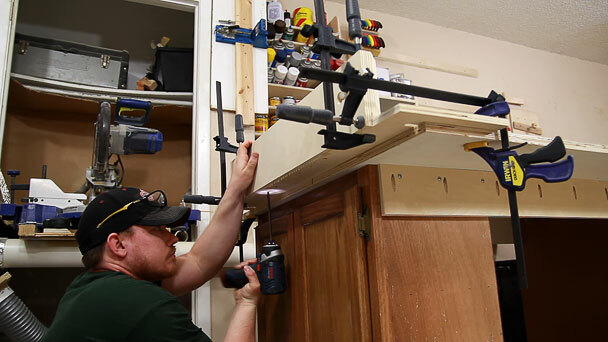 I see absolutely no need in purchasing an expensive hardware kit for a “professional” Moxon vise when you can make one that performs this well for so much less money. Two thoughts: 1. You should call this the MoxonBates vise! Ha! The MoxonBates vise. Thats funny. I used to have a blue no name brand jigsaw. It was reaaaaaally crappy. I could use one of these. Thanks. Wouldn’t the vice get in the way of the outfeed? Only if you are ripping something around 7 or 8 feet. You can always unscrew the hold downs and take the vise off. This is awesome! 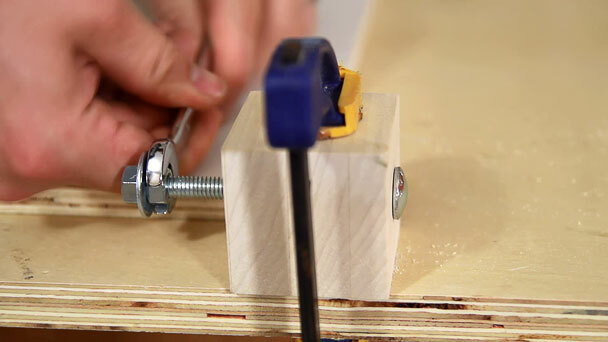 I’ve been thinking of ways to make a bench vise using threaded rod and this is the perfect solution for me. Although, I don’t think I will be using the threaded rod for this. Great idea! I’m going to make a MoxonBates vice for my table. Is the double sided tape enough to hold the tail pieces to the vice? I would have thought a screw on both sides of the tail piece would be in order. 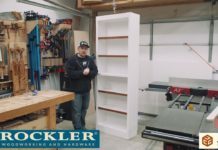 I started watching your show a few months back and I’m impressed with the projects that you design and build… this one included! p.s I’m from “Hockey Town”, keep rocking the hat. Just wanted to let you know how much I appreciate the downloadable plans and the tremendous projects that you provide. I’ve been woodworking for the past 15 months and love it. I retired from Television in 2010 and wish I had started then. You seem to know what I need just when I need it. 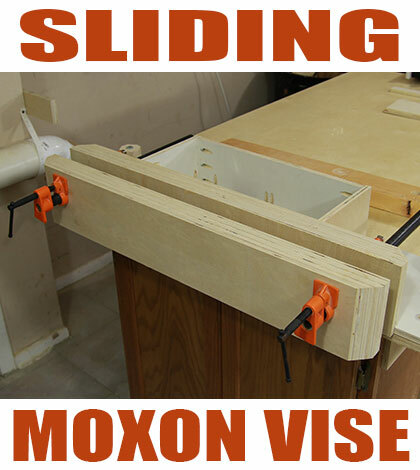 I’ll be working on the Maxom vise next week…..the mitre sled and the toy box for my grandkids after that. With these two additions to my shop it will be pretty much rounded out. I will drop you a few photos when I’m done. Keep up the good work. Chuck. I always wondered what to do while the glue is drying!!! Love it!! I’ve been making some research of the many types of homemade-built vises to do my own one, but your project is just the best I’ve seen! Congratulations for the idea, and thanks for sharing! I’ve been wanting to build something like this…I’ve seen many videos, but your’s seem to make the most sense! Love your projects. Hi Jay. I love the 2 screw vice. 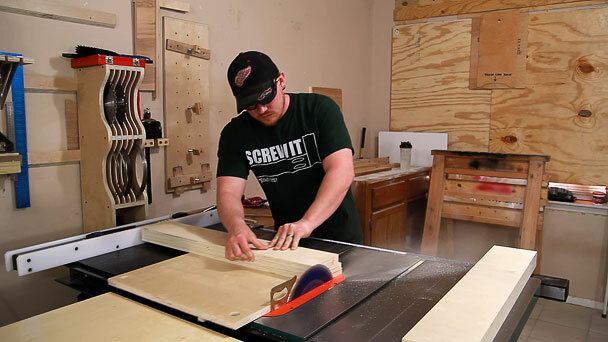 I’m about to build the Finewoodworking NotSoBig bench and I’ve been thinking about adding a 2 screw vice to the bench for dove tailing. I bumped into this on youtube and I love it!! I love you presentation as I don’t need to watch for an hour or more. What Jim in Atlanta said. This looks perfect for my shop remodel! And a major bonus….. Using the Kreg pocket screw system on an actual, working application. Thank, Jay! To cut dovetails, you need to hold a piece horizontal as you mark your pins (or tails). You should point out that the height of the support box wall should be identical to the stationary jaw. Thank you Jay. Great job on the vice, I’ve been watching your vids for about 4 months now and you get better with each one. I would like to make one observation…NOT A COMPLAINT or CRITICISM…a little narration when you are performing a cut would be helpful. THANK YOU again, I wish you & your family a MERRY CHRISTMAS and Happy New Year. Thank you for the feedback Rick. Merry Christmas to you and yours as well!! I prefer the silent video style. Can watch anywhere and no need for headphones. That’s actually a huge plus for me. 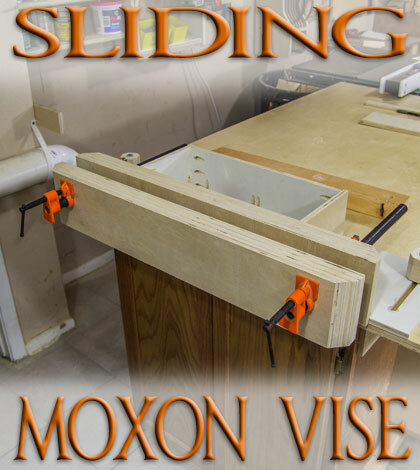 Awesome job Jay, PDFs were spot on when I built my Moxen vise. I have used it almost every day since. I have been needing a vice for a long time and this fit the bill for me. I had everything but the threaded pipe, carriage bolt and tee nut. For a total of about $18 I have a working vise. Thanks for all you do, keep up the hard work. My next build is going to be the cooler you posted. Very awesome Brad. It’s by far my most useful build yet. Great job J, What brand is the drill press and band saw if you please? Thanks! Utterly creative and actually more versatile than many of the available moxon style vises on the market. The thing I love most about it is you can modify it. I plan to start on my own variation of it in the morning! Thanks Big Jay!!! 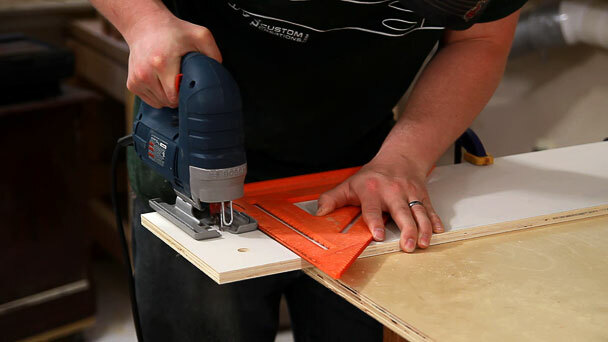 Has anyone tried this with something like 2×6’s for the jaws instead of cutting all that plywood? Would that work? Of course it would work. Plywood is more dimensionally stable and I had some on hand so I went with it. Ok thanks. Might go with the ply then if more stable. Great design. You didn’t say how many packs of crisps/chips you ate waiting for the glue to dry. Glue is a real pain in the neck when you’re waiting. Great vice. I built one with a modification. 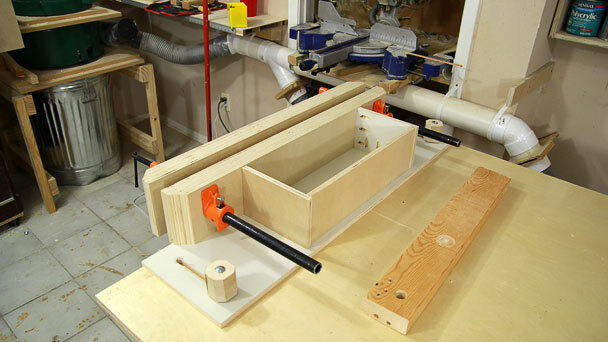 I made the rear box height 3/4″ shorter so I could put a piece on top to make it flush with the top of the jaws. I doubled it up with a piece below it that fits inside the box. I hold this shelf down with 2 spring loaded toggle latches. Then I drilled (4) 3/4″ holes in each jaw – fairly evenly spaced, and four more in the rear shelf (2 rows of 2 in line with the middle 2 holes in the jaws). I bought a set of 4 Kreg bench dogs, and now I can hold pieces in either the jaws or the dogs. How did you attached the clamp to the vice? Great design! I just completed my vise with a few modifications. 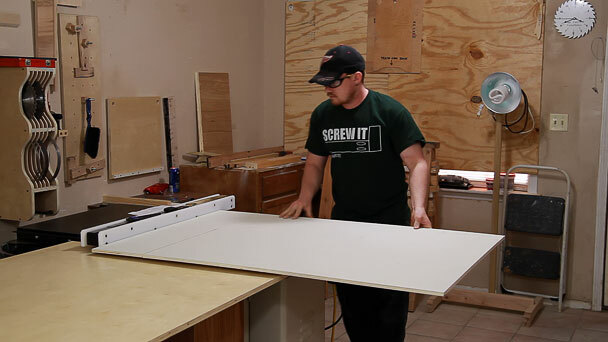 Due to space and materials I went with 3/4 plywood, 16 inch jaws and 16″ Wide x 12″ Deep base. This fit my work bench and allowed a 7″ sliding adjustment so I can handle 5″ stock on top of the bench. This is by far the best design I have seen on the web. You are certainly talented in the area of design. Thanks. 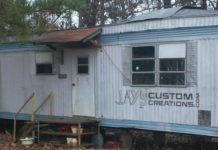 Hi Jay, I just discovered your site. I was searching for a Moxon vise and the search stops here. That’s the one I want. I downloaded the plan and i love the materials list – the final item being the beverages. I sure like a beer at the end of a day in the shed. When I am in the Kitchen, all my recipes start out “Pour a large cold beer into the cook. Repeat as necessary”. 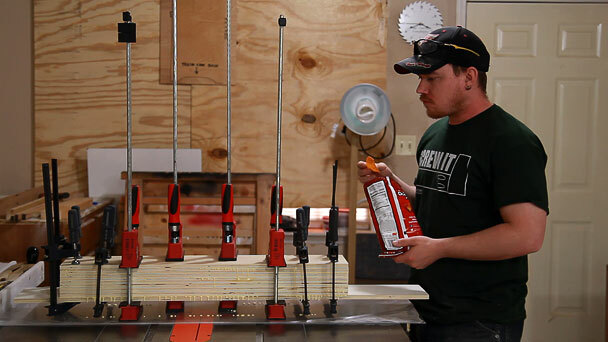 In the woodworking workshop it makes sense to make the beer the last item in the parts list. I like your style, Jay. Good job! 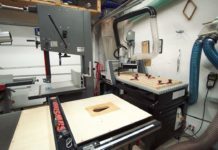 Where can I buy the moxon vise hardware kit? Hi it looks like a good vise do you have any plans or list of needed wood and sizes that would help us make one? You are funny and talented. LOVED the “watching” glue dry shots. Your attitude is awesome with “no money” to spend – so make it from what you have. Great stuff.